MIMAKI is a 45-year-old inkjet printing manufacturer in Japan. Its products include various printers, inks etc., covering textile digital printing, advertising signs, industrial and other fields with renowned brand all over the world. Recently, the "Textile Printing" reporter had the honor to interview the director of Guangzhou Branch of Shanghai MIMAKI Trading Co., Ltd. Uehara Yūki(上原久幸), and learned about the development of MIMAKI and its planning for the Chinese market. 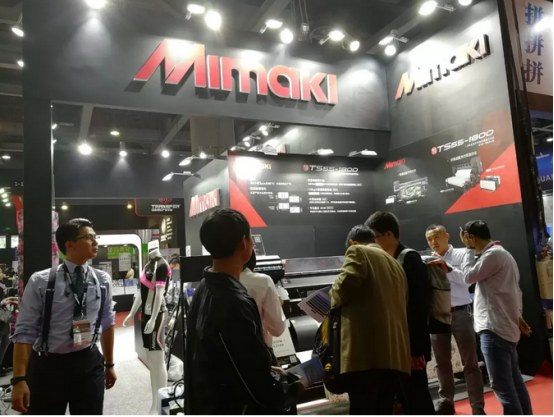 The printing equipment of MIMAKI is mainly for textile, industrial and advertising, among which the industrial field accounts for the largest share of the global market, around 40%~50%; and accounts for about 20% of the global market share in the advertising field. In terms of, the market share is relatively small. Therefore, whether it is from the perspective of the overall industrial chain or the analysis of MIMAKI's own sales, it comes to the same conclusion – MIMAKI is still in low involvement in the textile market. 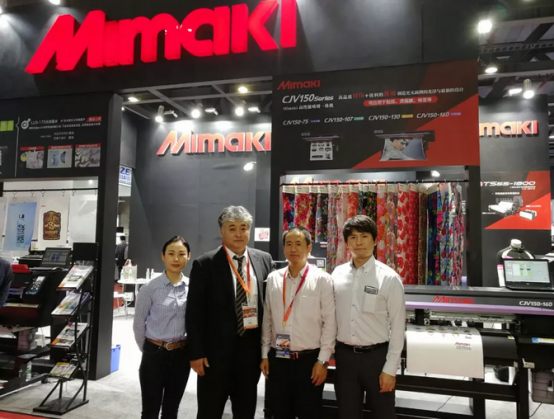 Mr. Uehara Yūki(上原久幸)from Guangzhou Branch of Shanghai MIMAKI Trading Co., Ltd. said that the market prospects in the textile field are unlimited. It is the main direction of MIMAKI in the future. MIMAKI will strive to broaden the textile market, accelerate the production capacity layout, and rush to diversify its business. The newly launched MIMAKI TS55-1800 is aimed at the textile market. It is a roll-to-roll water-based sublimation transfer inkjet printer, mainly used for printing transfer paper, with a width of 1.8m and a printing speed of up to 140m2/h. It can be continuously and stably operated for a long time, bringing new developments to textile digital printing. 1. Sportswear. Sportswear is increasingly popular with functional fabrics, mostly made of polyester, while polyester printing often uses dye sublimation transfer process. 3. Banner cloth, as well as a portable and durable light box advertising cloth. MIMAKI has been rooted in the Chinese market for a long time and has a strong influence. However, in recent years, domestic printing equipment brands have sprung up, and MIMAKI has felt a lot of competitive pressure. "Since last year, we have to realize that the strength of Chinese equipment is getting stronger and stronger." Uehara Yūki(上原久幸) said that Chinese domestic brands have become powerful competitors for MIMAKI. He believes that the number of Chinese brands is increasing, and printing technology is gradually matured, and their market share will be higher and higher. Stress is another momentum, and MIMAKI still has confidence in its own advantages. "Chinese domestic machines are still deficient in color management and stability. MIMAKI can provide customers with suitable solutions based on this situation." Uehara Yūki(上原久幸) said. MIMAKI also has its own RIP software, which can be used with MIMAKI printers for achieving high-quality printing. MIMAKI machines can also be connected to a wide range of RIP software worldwide, providing software system support for different color effects ideal for different brands. It is said that MIMAKI's machines have reached the special and strict requirements of high-end sportswear brands. Therefore, many customers use the machines to produce high-end products. According to MIMAKI, it is important to provide customers with more solutions. In the past, the idea of “as long as the machine is good, you can sell well” has fallen behind, and it is more competitive to provide customers with more solutions, solve their confusion, and meet their actual production needs. In fact, MIMAKI has built a production plant in China, and some of the machinery and equipment are produced in China. For machines that are locally produced in China, Uehara Yūki(上原久幸) has told users not to worry about the quality of the machine. "All MIMAKI machines are consistent in the technology no matter domestic or imported machines. All machines have strict quality control management before leaving the factory, and they are carefully checked and monitored one by one, so the quality of the products can be fully guaranteed." How much attention does MIMAKI pay to the Chinese market? From the Minister of the Business Department of the Board of Director of MIMAKI Japanese Business Headquarters, Mr. Yuchang Kangbo(羽场康博) ’ visit to China twice a month, we can obviously find the answer. On one hand, because of the rise of domestically produced machines, on the other hand, because China's textile industry is intensive and has great market potential, especially the production capacity of key markets such as Guangzhou, Shenzhen, Dongguan and Hong Kong which will not be transferred to Southeast Asia for the time being. Therefore, MIMAKI is developing more proposals to adapt to this part of the market. MIMAKI has established a branch in Guangzhou and an agent in South China, which has invested a lot of energy. “we are not familiar with the market situation if we only let the agents sell machines, therefore, we go directly to the customer site to understand the customer's needs and problems, and then make corresponding and innovative solutions for the customers to meet the their different needs. " Uehara Yūki(上原久幸) said. 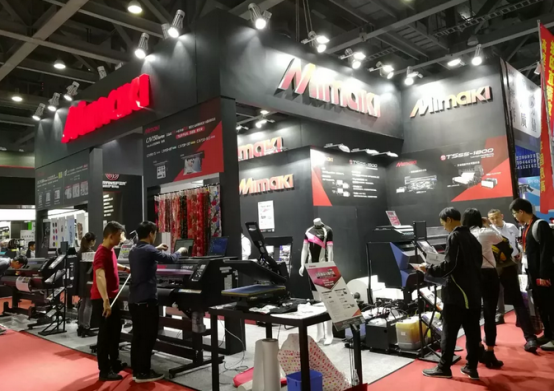 When talking about the strict environmental requirements of the Chinese textile industry, MIMAKI felt that the impact of entering into Chinese market was positive. Because MIMAKI is also one of the ink manufacturers, 30% of its sales come from ink. The inks produced by MIMAKI factory are targeted for the global market. They are made with carefully selected raw materials and have obtained international environmental certification. Therefore, the sales and use of ink in China is not a problem, and UV inks and dye sublimation inks are more environmentally friendly and are very beneficial for the promotion of their equipment. At the end of the interview, Uehara Yūki(上原久幸)revealed that MIMAKI is a research and development company and has already carried out research and development of the next model. Let us look forward to it!